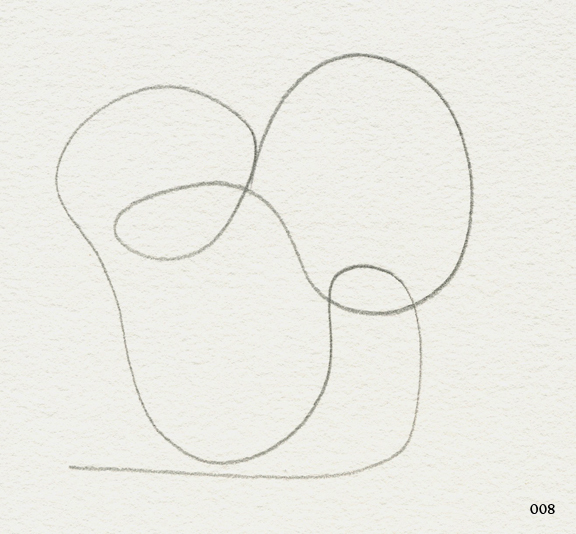 Weekly Challenge #84: "String Theory v. XI: Blind-Sighted"
Close your eyes to draw your string. That was the prompt for this week's Diva challenge. ...and this is my tile. If I hadn't just sat here and watched me do it, I wouldn't have believed it was the same string in both scans. 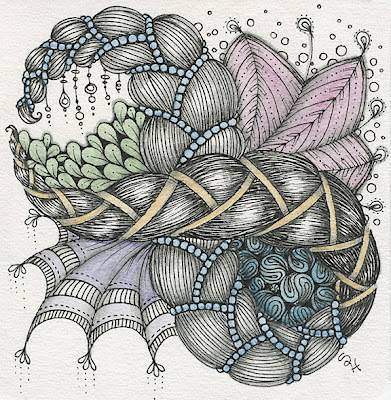 I know the original string is in there somewhere, but I've added so much fluff to it that I can't tell if it's even rotated in the same direction as the scan of the finished tangle. So if you're looking for a second challenge, feel free to hunt for the above string in this tangle. Pretend it's 'Where's Waldo', only in this case Waldo is very skinny, very tall, and very bendy. And gray. And shirtless. I'm a perfectionist. I didn't always know this about myself, or maybe I wasn't always one and I'm just settling into my own shoes a little as I get older. But "ehh.... good enough" is probably not something you'll hear me say. Because if I'm working on something I care about, and I know it's not the best I am capable of, I have to force myself to not redo every little thing and make it as good as I know it could be (and yes, I do realize that this occasionally makes me a little bit annoying). For example, I've attempted a few methods for collecting and organizing tangle patterns... index cards, flip cards, graph paper pads, Moleskine notebooks, different-sized journals, a small binder with page protectors, et cetera. First I had to let go of the idea that any journal I created would/could ever resemble Maria's... that just wasn't realistic for me. I don't mean that in a self-depricating way... but she uses journals that the pages don't rip out of. Having a journal full of mistakes and oopses and crossed-out things next to the occasional pattern that came out absolutely perfect would drive me insane. Once I cleared that mental hurdle, it was easier to think realistically about what I needed. Here's how my lofty standards and I arrived at a solution I could run with. The top binder contains my seminar notes, workshop resource pages, my price list, my tangle pattern PDF from Linda Farmer (a $10+ donation will get you one of those here), and other miscellany. 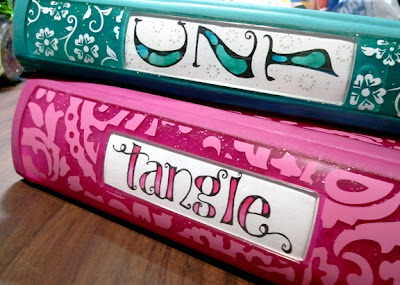 The pink (1.5") binder on the bottom is my personal tangle pattern collection. It goes without saying that it's a work in progress. This beast of a craft punch came from Michael's. 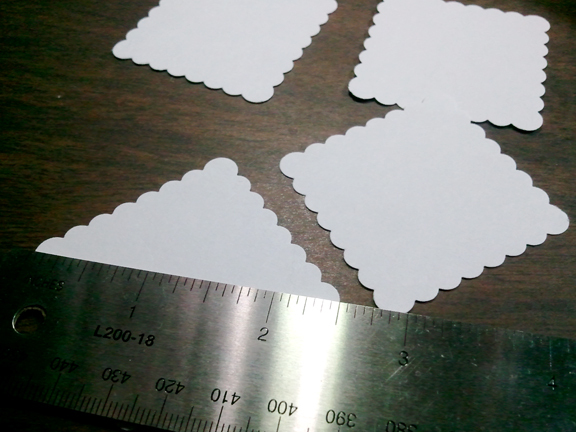 This size was available with two different edges, this scalloped one and another one with plain straight edges. Hobby Lobby is my usual haunt, but they don't carry a punch (that I saw) in this exact size and shape. Kudos to the manufacturer... it has held up really well, and as you'll see in a minute, it's got some serious miles on it. 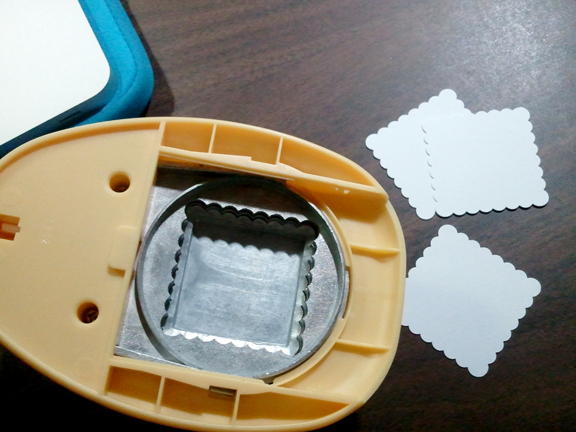 This one is 2.5 inches if you're measuring diagonally (I think that's how these punches are marketed), or about 1.75 inches on each side. I'm sorry about the quality of these pics... the glare from my work lamps blows out the whites, and I can't do much about the shadows. Hopefully you can still see ok. 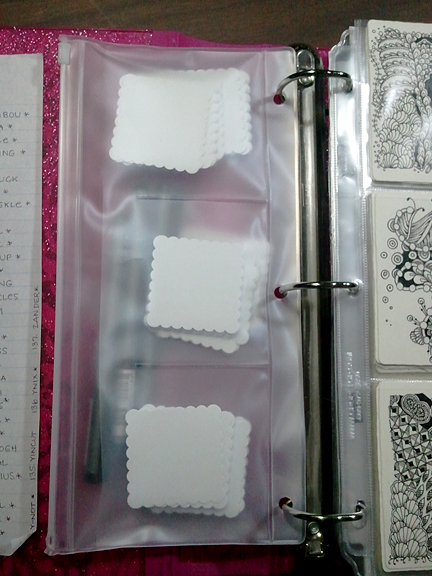 I keep spare blanks in a zipper pocket in the front of the binder with a few pens so everything gets stored together. 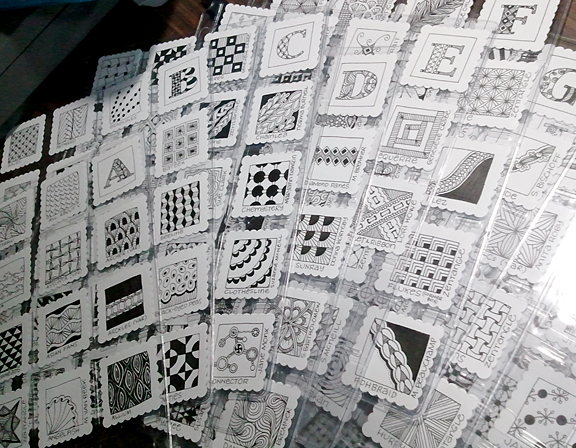 These are from blank white 4X6 index cards... you can get six squares from every index card if you're careful. 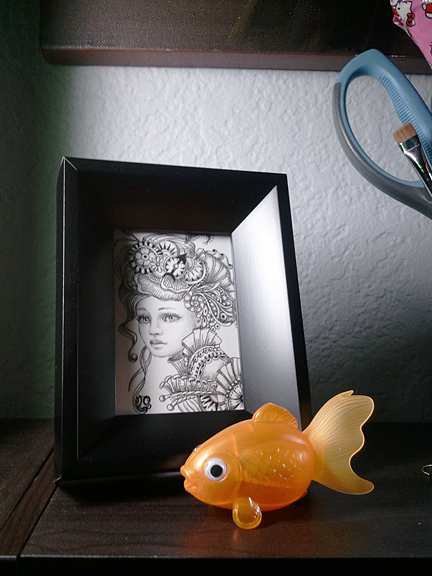 No, those are not Microns... they're Copic Multiliners, and I LOVE them. They're waterproof and archival and pigment-based just as the Microns are, but the barrel is more comfortable to hold. So here's the cool part... these are coin collecting pages! 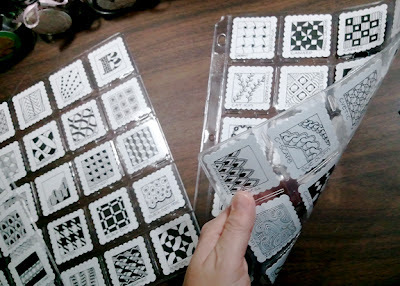 They're thick and sturdy, and you can get 40 tangle patterns in one sheet, front and back. And, awesomest of all, the paper doesn't fall out. Ever. They're not crystal clear, but they're good enough. It's not archival quality plastic, but I really don't care about that. 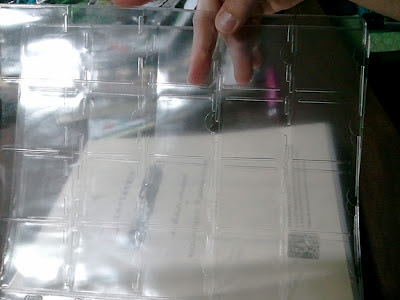 A word of advice: If you're planning on using these, take them out of the plastic and lay them out unstacked for a few days so they can air out. You know that overwhelming, noxious smell you get when you open a new shower curtain? Oh yeah... these'll make you dizzy. Here's a scan so you can see the page more clearly (still missing the names on some of them, but you get the idea). This is the side with the pocket openings... see how they slide in the top? Front and back view... room for 20 patterns per side. So far I have only had to go to a second sheet for a couple of letters. I opted to skip the shading on these to save time, but also because I didn't know if the pencil would eventually rub off on the insides of the pockets. I really didn't want to risk everything getting smeary after having put so many hours/days/weeks/months into this project. Then I would have to redo the whole thing. Just kidding. Sort of kidding. I don't want to think about it. I made page markers for the upper right-hand corner of each sheet by printing out the alphabet in a font I like (it's Jimbo, in case you care), traced them on a light table and tangled them. 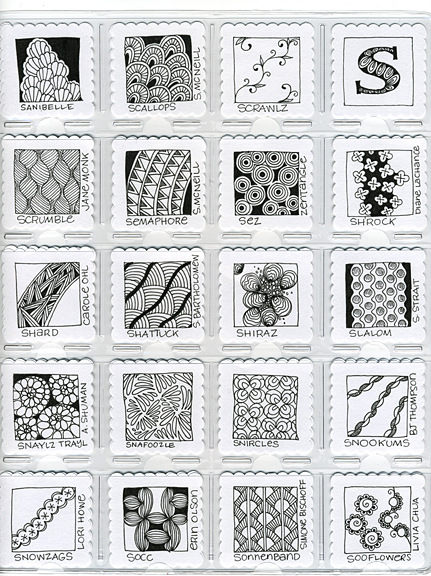 I'm in the process of adding all of the 'official' tangle patterns that aren't published/obvious/available to the general public. (Probably should have done that first.) 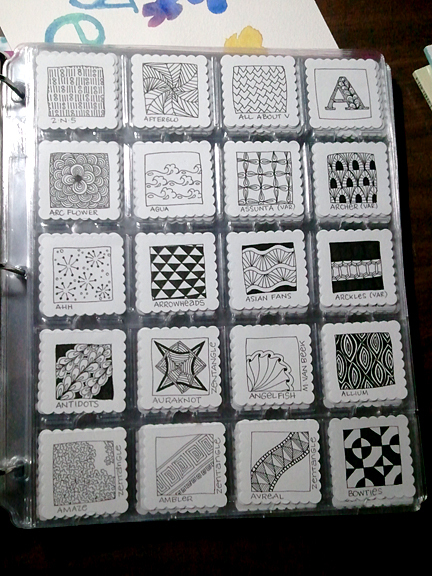 Eventually those will have their own section in the binder. I was in the middle of the Cs when I started adding the name of the person who came up with the tangle pattern on the side of each square (the name of the pattern is across the bottom). I haven't gone back to add names to the first ones yet, but I'll get to that eventually. 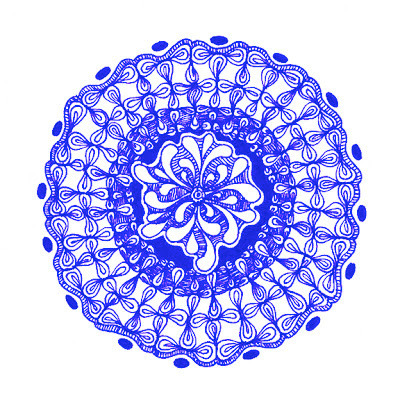 Then I'll start combing blog posts and Genevieve Crabe's weekly roundups for new patterns to add. 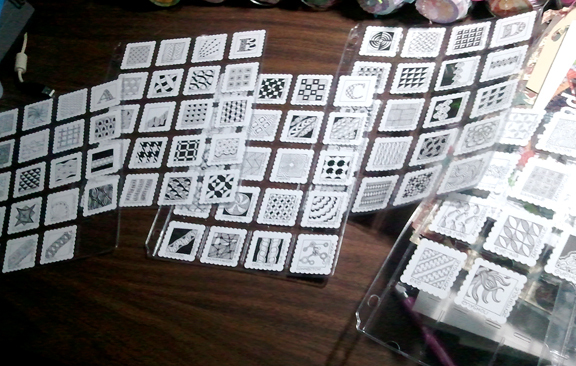 I LOVE that I don't have to throw away a whole sheet of paper if I mess up one pattern. Especially since some of these took me several tries to get right. 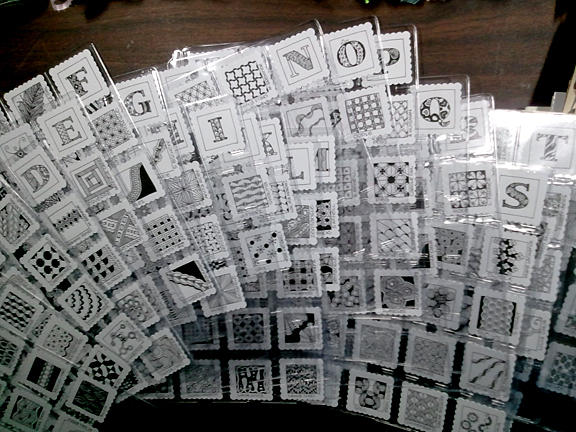 I have them grouped by the first letter of the pattern names, but they're not alphabetized within each group. That way, if somebody comes up with a pattern called 'aardvark', I don't have to pull out all the patterns on the A page to put them in order. That would definitely cut into my tanglin' time. A shiny new black .01 Copic Multiliner! You can check back after Sunday to see if you won. Have a tangly week! Hey, tanglers! Weekly challenge time. 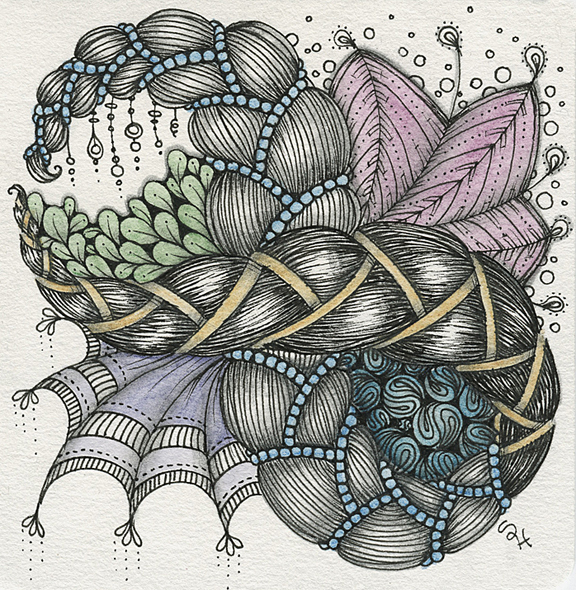 I'm on it early this week because I'm recovering from a long weekend of frolic and fun... and tangling for a couple of hours sounded so much more inviting than laundry. Who knew? I don't mind Assunta. Mooka, however, is a problem child. It could just be me (and by the looks of Maria's work, it is) but Mooka always seems to look a little too flat and low-contrast to be really satisfying to use. The variation I ended up with is a pattern I really like, though. The pods and curls are nested more loosely, and the stems are 'skinnified' so there is no confusion with what parts to shade and avoid. If you've never used it, here's your heads-up: when drawn 'correctly', Mooka is a little bit of an optical illusion and has to be shaded carefully so as not to muck it up. Short post this week, 'cause I'm working on something FUN. I'll share soon. Thanks for reading... I hope you find a $20 bill in the dryer. Or the dishwasher... I don't discriminate. Hooray... it's the weekly Diva challenge! I skipped the last two weeks, and I've really missed doing them. 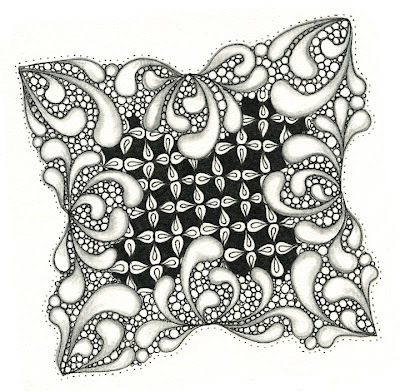 I took a swing at last week's zendala dare, but so far I have found zendalas to be a little too structured for me. Maybe I need to start with a simpler one and work my way up... so. many. sections. 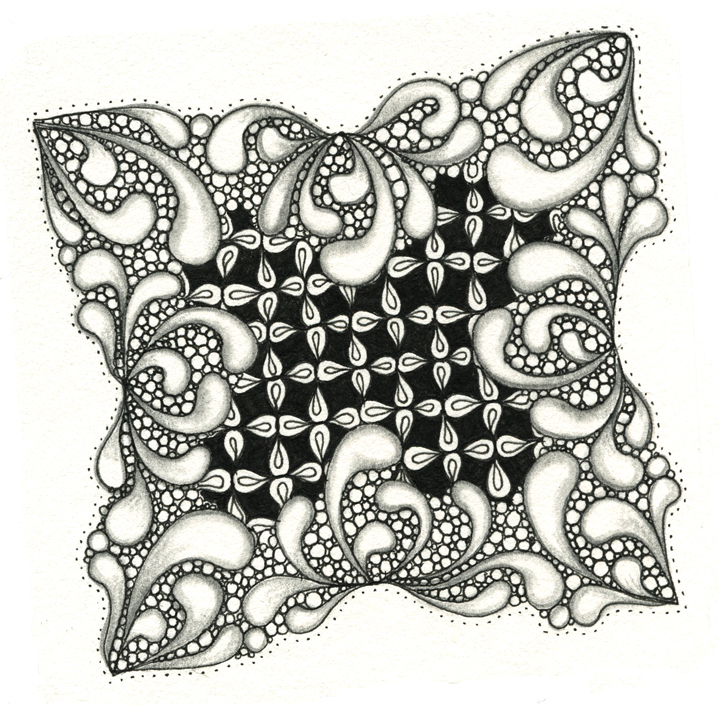 The 'guest tangle' for this UMT challenge is 'Brayd'. I like it. 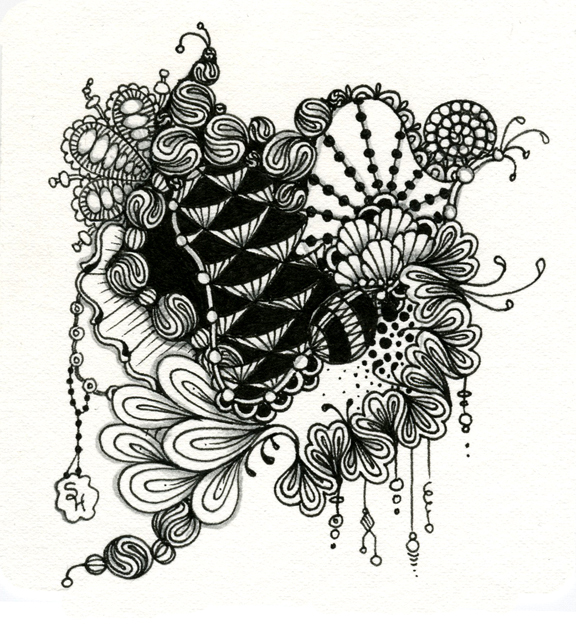 Drawing the main tangle felt more like sketching than tangling, though. It's the highlighted sections that make it feel sketchy, I think... because figuring out where the lines will break and resume again requires a bit of thinkery. And getting them consistent enough to look 'right' is like trying to nail jello to a tree (thank God for shading). I added color because the final result was so dark. Well, ok, and also because I look for ANY excuse to bust out my Inktense watercolor pencils. Remember the smell of newly sharpened pencils? You know what I'm talking about...that sharp, clean, woodsy aroma? I get that when I pop the lid off the tin... takes me right back to shopping for school supplies years ago. I still remember how erasers smell, too. And crayons. A side (bottom) note for journal lovers- or, more to the point, people who love the idea of journaling but don't have the time. I love journals.... love love LOVE them. I buy them all the time, and then they sit around and collect more dust than ink. 'Cause who has time for that?? 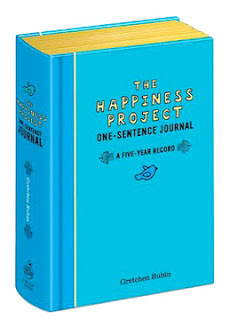 Recently, however, I bought a five-year journal. It's not a big book, because you only have to write one sentence per day. You only get four or five lines at a time. The space is just big enough for a brief recap of the day. 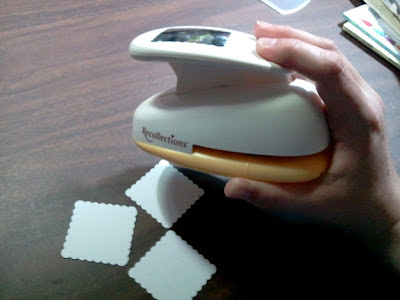 Or you can use it to write a short daily note to a loved one. Or for short prayers... or you can write down the things you're thankful for, if you want to use it as a gratitude journal. (They also make these for moms, FYI. And gardening. Et cetera.) A friend of mine is a teacher and I would love to see her use one of these to write down quotes from her second/third-graders, 'cause some of the stuff they say is hilarious. The possibilities! Anyway, the one I wound up with makes me think of blue skies and buttery sunshine, and makes me happy just to look at it. If you want to know more, you can read a blog post from the author here.